Take powdered sugar and soft butter/margarine in a large bowl. Knead until it gets homogeneous. Add starch slowly, while kneading. Also, add vanilla as well. Then, add flour slowly. Knead until the dough becomes smooth and soft. If you use excess flour, it will be difficult the give stable shapes. So, you do not need to use all the flour mentioned, if you think the dough is already soft and smooth (I used 2 cups of flour, though). Grab large pieces of dough and on a flat surface roll it with your hands to make a long stick, thick as your thumb. Using a knife cut 1 inch pieces diagonally. Make stripes with the back of a fork on each piece pressing gently on the surface. Use the same procedure for the remaining dough. Place them over a greased oven tray leaving room between. Bake in a preheated 325F (160 C) oven for about 20-30 minutes or until their bottoms get pinkish. Make sure the tops remain white. Make sure they do not turn pinkish. 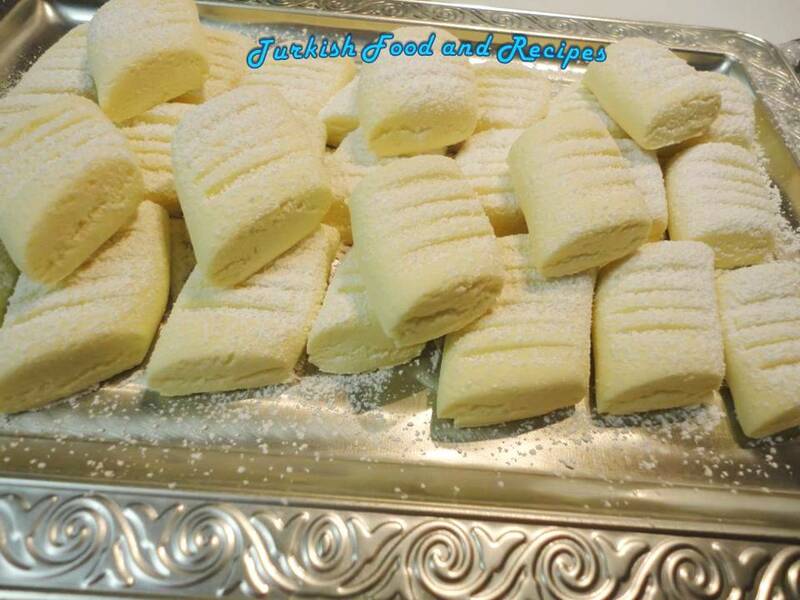 Let them cool for a while and if you desire sprinkle with powdered sugar on tops with a strainer. Bir kaba pudra sekeri ve oda sicakligindaki tereyag/margarin alin ve guzelce yogurun. Sonra yavas yavas yedirerek nisastayi ilave edin. Vanilyayi da ekledikten sonra yine yavas yavas unu ilave edip yedirmeye calisin. Elde edeceginiz hamur cok yumusak ve puruzsuz olmalidir. Eger unu fazla gelirse sekil vermekte gucluk cekersiniz. Eger hamurun yeterince yumusak ve puruzsuz oldugunu dusunurseniz unun hepsini kullanmak zorunda degilsiniz (ben tam olarak 2 su bardagi un kullandim). Hamurdan parcalar kopararak sert bir zemin uzerinde uzun silindirik seritler yapin (yaklasik bas parmaginiz kalinliginda). Bu seritten 2-3 cm uzunlugunda verev sekilde lokmalar kesin ve uzerlerine catal ile hafifce bastirark cizgi deseni verin. Ayni islemi geri kalan hamura da uygulayin. Yaglanmis firin tepsisine aralikli olarak dizin. Onceden isitilmis 160C (325F) firinda yaklasik 20-30 dakika pisirin. Uzerleri pembe olmadan, sadece altlari hafif pembelesince cikarin. Kurabiyeler biraz soguyunca uzerlerine arzuya gore suzgec yardimiyla pudra seker serpebilirsiniz. Just made these and they are delicious. I added some cocoa to half the batch and made chocolate ones as well.